For many people, the ability to earn an income is their most valuable asset. Losing that ability would have a devastating effect on them and their families. For many families it would be impossible to continue the lifestyle to which they’ve become accustomed. A death or disability in a family could seriously hinder the financial future of a spouse and children, if precautions were not put in place. Preparing for emergencies and tragedies can make a world of difference for a family facing the unexpected. A solid financial foundation is comprised of assets that provide protection and savings. Choosing these assets requires thoughtful consideration. What kinds of assets do you currently own that serve this purpose? What kinds should be your next priority? What role should life insurance play in helping you build a solid financial foundation? A strong foundation provides protection and savings. Portfolio diversification may reduce risk. Proper risk management is essential to securing your financial future and accomplishing your accumulation goals. Proper risk management is essential to securing your financial future. Insurance is an integral part of establishing a safety net, should something unforeseen occur. It provides protection against life events that could significantly impact your financial well being. Life insurance is unique in that it can be an effective tool for both protection and accumulation. It does provide a death benefit, and some types include a cash value accumulation that can be used for various life needs. Policy loans or partial surrenders will decrease the cash value and have a significant impact on your policy’s performance and future dividends. Should you die before the loan is paid off, any outstanding balance and interest will be deducted from the death benefit. Tax consequences may also apply. 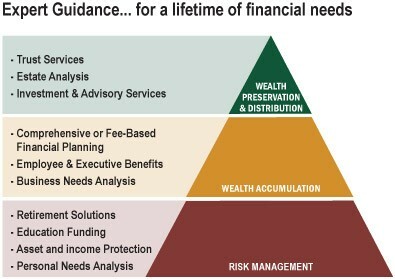 Looking at the pyramid, you can see that life insurance is not the only type of protection to consider when building your foundation. Because of its lifetime benefits, life insurance is arguably one of the most important types of protection to have. The stage of life you are in and the needs you have affect what kinds of insurance you will want to purchase. The whole point of insurance is looking to the future, admitting it is unpredictable, and acquiring protection against what may come. Life insurance, disability income insurance and long-term care insurance take into account the individual needs of each family member. This protection can minimize the financial impact of life’s unexpected tragedies while providing a strong financial foundation for future growth. How long will your assets last in retirement?